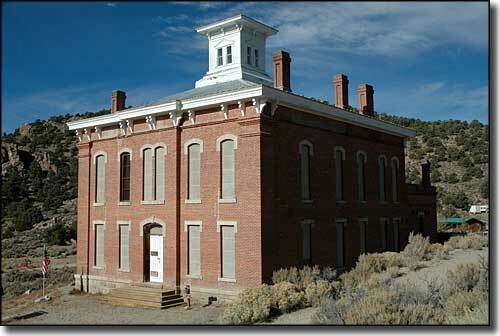 Belmont Courthouse was the seat of government in Nye County from 1876 to 1905. The Courthouse has been partially restored and is open to the public but the Historic Park offers no developed services. Camping and picnicking are available on nearby public lands. The nearest developed campground is the Pine Creek Campground in the Monitor Valley, about 20 miles north of Belmont via State Road 82. There are no tourist services (including gasoline) or public park facilities in Belmont. The Courthouse was built at about 8,000' in elevation on the southeastern slopes of the Toquima Range. In October, 1865, the first official mining claim in the area was filed by a Mexican prospector named Antoine Borquez. He'd found rich, high-grade surface deposits of silver ore. By 1867 the population was at 2,000, second only to Virginia City in the Nevada Territory. As the mine seemed to be permanent, maybe 50 buildings were built in Belmont, including a school, a bank, 2 churches, a general store, a post office, a telegraph service and offices for 2 newspapers: the Mountain Champion and the Silver Bend Reporter. Some farmers and ranchers had settled in the Monitor Valley in 1866 and were soon providing the miners with poultry, livestock, corn, wheat, rye, peaches, apples, apricots and berries. As the population grew though, the Belmont merchants had to reach out to other nearby Mormon ranchers and eventually established a regular exchange trade, offering dry goods, cooking utensils, cutlery, hardware, and other supplies for agricultural products. In order to get supplies to Belmont, the merchants had their stuff shipped from Sacramento and San Francisco to Austin, 90 miles to the north. Then it was freighted over the hills in horse- and mule-drawn wagons. When the mine began to decline in 1869, quite a few of the miners moved on to the next big silver strike in Eureka. However, the Nevada Legislature had passed a bill in 1867 moving the county seat from Ione to Belmont. After moving the court location several times, the county finally had a building designed and built and the County Commissioners moved into their new offices in 1876, about the same time mining production almost came to a standstill. There were short bursts of renewed mining in 1883 and 1885 but that was pretty much the end of it. In 1903 most of the remaining miners moved to the new strike at Tonopah and in 1905, the county seat moved there, too. In 1974, Nye County deeded the courthouse to Nevada State Parks, who then took action to repair the roof, install interior bracing and seal the building against the weather. Belmont Courthouse State Historic Park is located about 45 miles northeast of Tonopah via US 6, State Road 376 and the Monitor Valley Road. Photo of Belmont Courthouse courtesy of Wikipedia userid Vivaverde, CCA ShareAlike 3.0 License.